A scared megacorporation does not run and hide in the shadows. Instead it lashes out, swiping with sharp claws, not caring who is hit by the blows. Many of the megacorps are currently reeling, hit by multiple harsh wallops. NeoNET and Evo are dealing with the fallout of the CFD virus, Ares has powerful forces eating it away from inside, Horizon backed the losing side of the Aztlan-Amazonia war, and the Japanacorps are rearing back to take on the world - and each other. When the corps get aggressive, shadowrunners get called, and blood gets shed. Bloody Business is a campaign book giving players the chance to earn piles of money from the megacorps as they reel through troubles and crises. It'll take a lot of good shadowrunning moves to earn that cash - and even better moves to survive long enough to collect it. With short adventure outlines that can be played independently or linked into a longer campaign, and NPC stats to suit a wide variety of situations, Bloody Business plunges Shadowrun teams in the middle of corporate chaos. 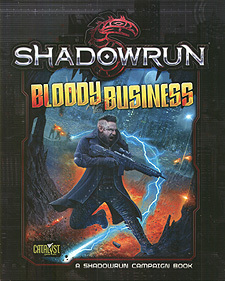 Bloody Business is for use with Shadowrun, Fifth Edition.